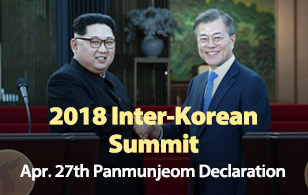 South Korea has picked "Peace, a new start" as the slogan for the upcoming inter-Korean summit set for April 27th at the truce village Panmunjeom. Presidential spokesman Kim Eui-kyeom on Sunday released the slogan, saying it signifies the journey that the two Koreas will have to take to achieve global peace as they will hold their first summit in eleven years, which will also serve as a guide for the summit talks between North Korea and the U.S. The spokesman said that the slogan also represents the whole nation's wish that this rare opportunity will be the beginning of peace. 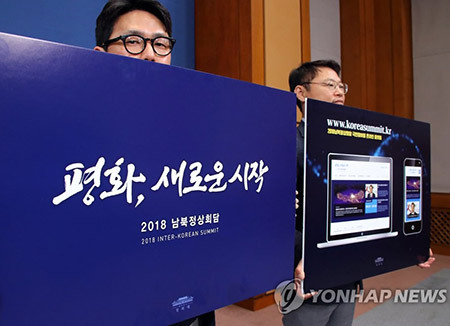 The slogan will be used for the government's official briefings and various promotional materials. Meanwhile, the inter-Korean summit preparatory committee said that it will open a Web site (www.koreasummit.kr) on Tuesday to swiftly provide people with all the news and data related to the summit.